The software product is designed for formation backgrounds of printed forms with the effect of toning of latent images on copying. The program creates a neutral background to be printed on a printed form. The printed form may be printed at a printing-house or by an office printer. While copying such a form, the latent image becomes visible. 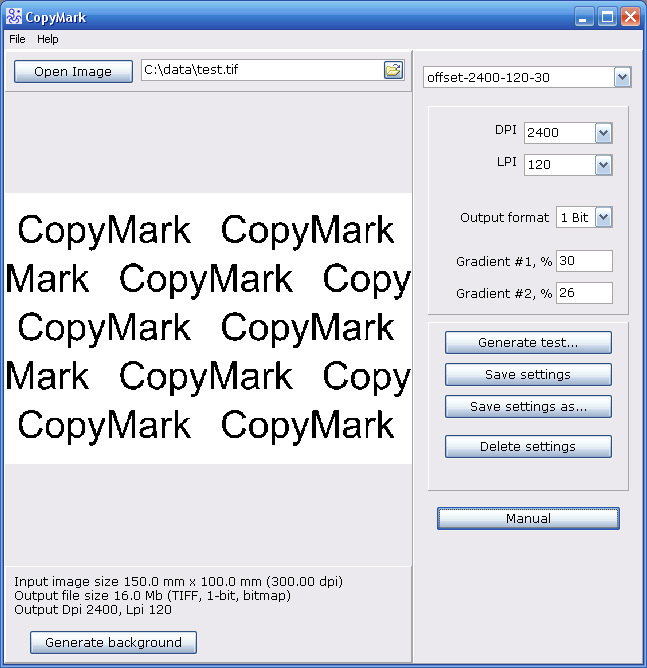 Many modern copying devices can make copies with the minimum difference from the original and the latent images are toned on such copies faintly. Nevertheless, the security features operating in accordance with the said principle are used for all securities, including token money. In addition to the effect of toning of latent images, a generated background includes a unique pattern that never appears on a repeated generation. This circumstance enables to inspect genuineness on the level of expert's examination and to discern the original from a falsification (even of a professional quality) with a high probability. 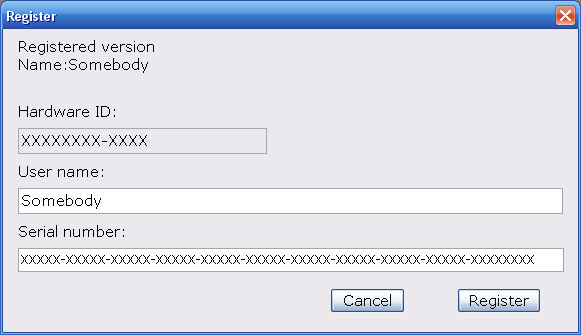 Generation of a unique pattern means that another user having the same software will not be able to make the same model of a printed form. Many expensive programmes for developing securities allow producing the effect of "latent image"; however, in a majority of cases, the protective effect appears to be too weak. 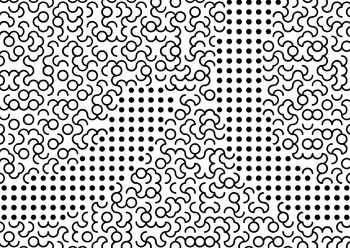 It is caused by the fact that usually a user changes parameters of a pattern for many times and finally selects the most beautiful one feeling no concern about the protective effect. We offer you the optimum technical solution of the task instead of such experiments. In the next chapter, we'll discuss the theory of encoding latent images in details and explain why the offered solution is the optimum one. The generated background can be imported to a layout of any graphics editor (Adobe Photoshop, Illustrator, InDesign, PageMacker, Corel Draw, Quark, Macromedia FreeHand and others). 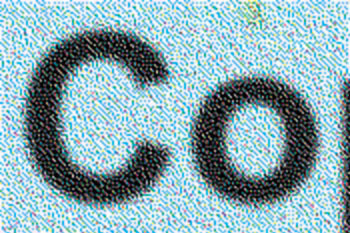 The image cannot be deformed (compressed or extended); it can be turned to 90 degrees only. The colour of the background can be replaced for a colour with 100% filling. For example, black colour can be replaced for CYAN-100% or Pantone_Green-100%, if such ink is used in printing. On printing documents, usually less contrasting colours, such as orange or grey, are used for such patterns. 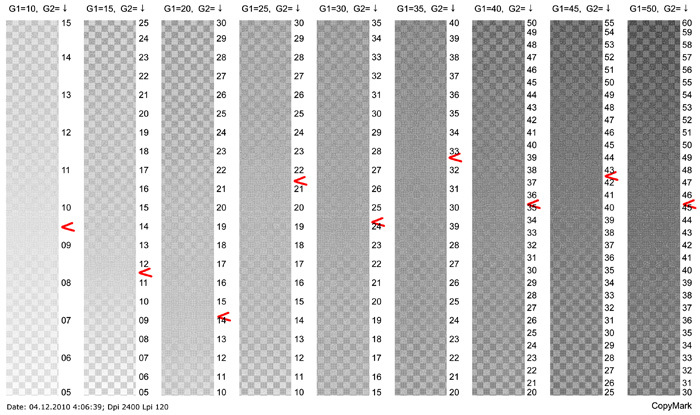 If less contrasting colours are used, the optimum value of the gradient #1 = 35% is set and the background is not too dark. 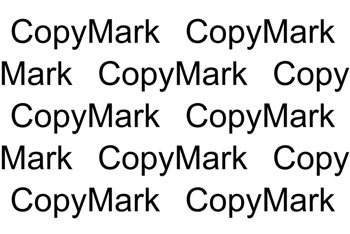 CopyMark V1.0, GuardSoft Limited, 2010.